After a late night of drinking with Adam and our significant others, I decide I want to go fishing, but the winds still aren’t in fly fishermen’s favor so we decide to go chase gar. The following morning I wake up around 9 am and as usual the first thing I do is take a look at wind and surf forecasts. Much to my surprise the weather man had lied the night before and the surf was flat and winds nil. Being hungover I decided to not make the 40 minute drive out Mathis and instead take the 5 minute drive to Packery South, not expecting much. Whenever I fish the jetties I usually throw sinking lines. In my experiences with most fish at the jetties you usually want to get down pretty deep, so I decided to try something different then the usual intermediate fly lines I throw. I got word of Orvis Online selling depth charge fly lines for $24.99 I decided to pick up a couple in 8wt (300g sink rate: 6-8ips) and 10wt (400g sink rate:8-10ips). As I get to the beach I was welcomed by calm seas and blue water clear onto the beach. 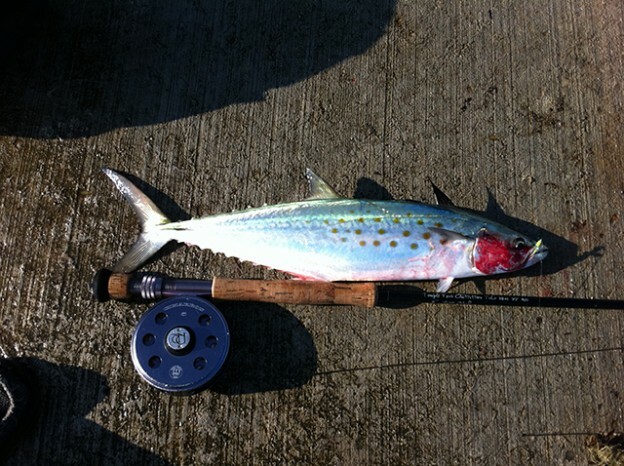 I rigged and made my way down the jetty to find spanish mackerel working really close to the rocks and bonito working right out of casting range. It was also toward the end of the sheepshead run so bait fishermen were catching them in the channel on live shrimp with the occasional redfish mixed in as well.